First, a note about the artist's name. It is typed in quotes because this is a pen name, and his real name is not known. I find the name fascinating because "Tatsuta" (竜田) is the name of a small city that's quite nearby the crippled power plant (which I'm guessing is no coincidence). Despite it's close proximity, and despite it being all but deserted, Tatsuta still "operational" in that the town is pretty much the closest to the plant one can travel via public transportation, and a handful of businesses near the main train station are open. Also interesting to note is the alternate reading of the name "Kazuto," (一人) which is "hitori," meaning "alone" or "lone." 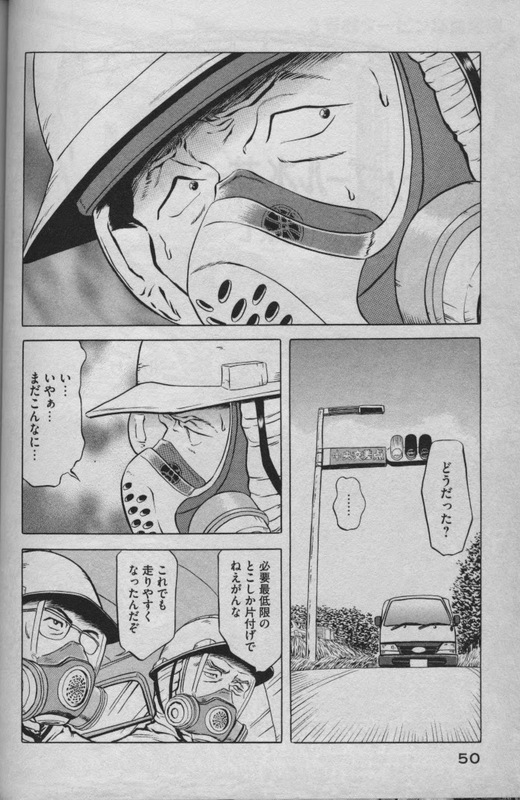 "Alone in Tatsuta" is an image that is probably true much of the time in towns so close to the Fukushima #1 reactor. 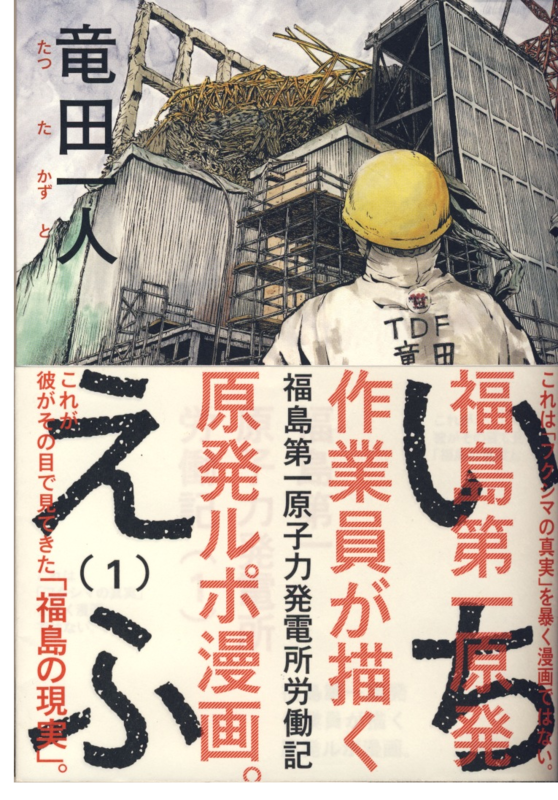 Primarily, my interest in this manga comes from that fact that 1F is completely drawn and written by a laborer at the power plant, based entirely on his firsthand experiences working there. I don't think there can be a better source of factual and unbiased information about the situation than this! When I first picked up this manga at the local book/CD shop I wasn't sure what to expect. Considering all the bad press and alarmist news reporting about the March 2011 accident and aftermath, what sort of story awaited me inside the pages, I could only imagine. A true life horror story? A tale of pending doom perhaps? What I found instead of such stories, is a story of hope, bravery, dedication and strong camaraderie. We've all heard the frightening stories of hazardous working conditions, contamination, unfair labor practices, etc etc. 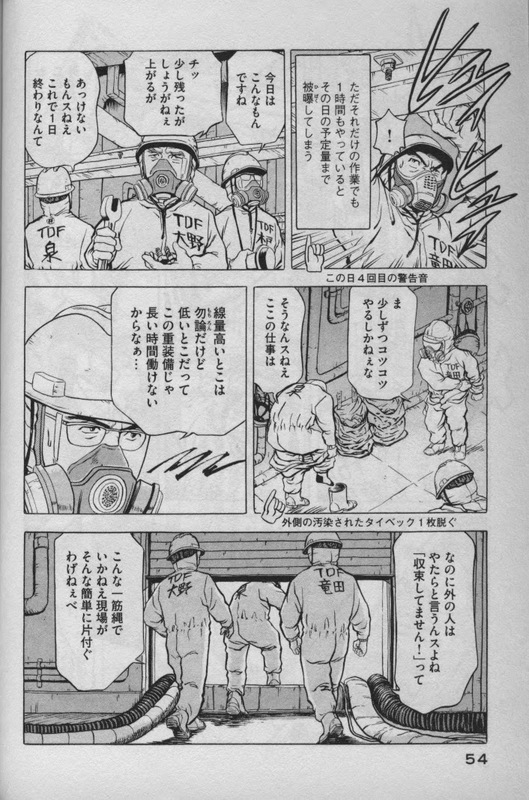 While it must be possible that a few of the stories are true, the reality of the laborers' daily work life at the Fukushima power plant appear to have very little in common with the stories from the rumor mill. Many of the workers were born and raised in the Tōhoku area, in or around Fukushima Prefecture, but also lots of workers, like the artist himself, came from far away in order to find steady work and to have a chance to make a difference in the restoration of Northeastern Japan. The workers at the power plant work extremely hard to restore safety to the site. Safety is by far the most important concern for the laborers and contractors working there. Each and every day begins with a long sequence of donning protective gear, proceeds with continuous safety measures, and ends with a complete evaluation, or "survey" of each worker's health. While radiation is of course inevitable, the workers' daily exposure is quite minimal, and every laborer's daily exposure is recorded. When they've reached their maximum permitted exposure for the year, they cannot return to work at the plant until the following year. The story of 1F is very fascinating and immediately drew me in, allowing me to identify with the characters in such a way that I really look forward to seeing what they're up to. It's by no means an easy life, but the workers at the Fukushima #1 Power Plant have lives deserving of respect, honor and admiration. If there's any aspect of their situation that could be considered unsettling, it's that considering the work they do, their pay is surprisingly low. If something could be done about that, that would be a wonderful thing for them. All these things aside, being a work of manga, readers must wonder, "how's the artwork?" In short, I love it! The images convey a certain playful friendliness that help bring the characters closer to our hearts. The story is informative and interesting, at times funny, and at other times inspiring. The artwork never fails to communicate these feelings, and besides this, 1F gives the readers a close up and personal look at a world we could never know otherwise. The first volume is a complete story all it's own, but still I hope we can expect more volumes of 1F soon from this mysterious artist known at Kazuto Tatsuta. ** NOTE: The English language title of this manga is my own translation. I was not able to locate an official English title, but if one exists and/or I've gotten it wrong, please leave a comment. Thanks! Burger King Black Diamond Burger!